Baronissi - Salerno, June 22 2012 - The Laboratory of Molecular Medicine and Genomics at University of Salerno announced today that it has successfully completed Illumina CSProTM certification for Infinium Genotyping, Gene Expression and Sequencing gaining entry to an elite group of Illumina genomics service providers globally. Illumina Inc., a San Diego-based company, provides leading-edge genetic analysis tools to genomics centers worldwide. 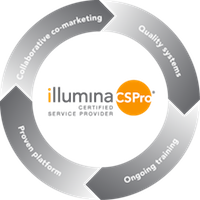 Illumina CSPro is the collaborative service provider partnership dedicated to ensuring the delivery of the highest-quality data available for genetic analysis applications. Illumina CSPro participants undergo a rigorous two-phase certification process that includes minimum data generation, data certification, and an on-site audit of the facility and processes. "Illumina CSPro recognizes organizations that provide customers with industry-leading data quality and service in genetic analysis," said Karen Possemato, Illumina's Sr. Director of Corporate Marketing. "The Laboratory of Molecular Medicine and Genomics of the University of Salerno, Baronissi - Italy is now a CSPro able to provide Infinium Genotyping, Gene Expression and Sequencing services using Illumina technology. Now LMMGe is a global CSPro partner, we are excited to work with them to make it easier for researchers in Italy and Europe to access the power of Illumina's genetic analysis technologies."